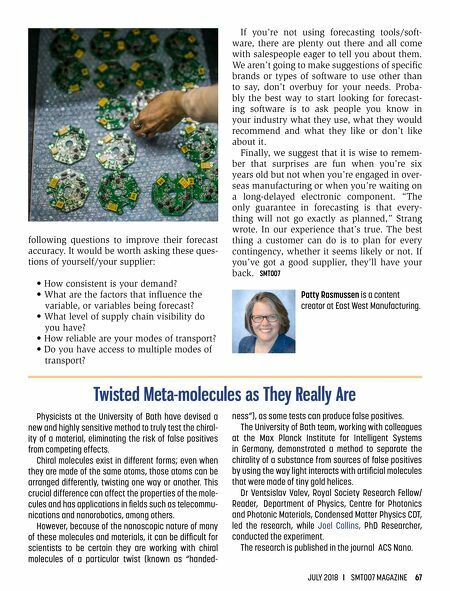 JULY 2018 I SMT007 MAGAZINE 67 Physicists at the University of Bath have devised a new and highly sensitive method to truly test the chiral- ity of a material, eliminating the risk of false positives from competing effects. Chiral molecules exist in different forms; even when they are made of the same atoms, those atoms can be arranged differently, twisting one way or another. This crucial difference can affect the properties of the mole - cules and has applications in fields such as telecommu- nications and nanorobotics, among others. However, because of the nanoscopic nature of many of these molecules and materials, it can be difficult for scientists to be certain they are working with chiral molecules of a particular twist (known as "handed - ness"), as some tests can produce false positives. The University of Bath team, working with colleagues at the Max Planck Institute for Intelligent Systems in Germany, demonstrated a method to separate the chirality of a substance from sources of false positives by using the way light interacts with artificial molecules that were made of tiny gold helices. Dr Ventsislav Valev, Royal Society Research Fellow/ Reader, Department of Physics, Centre for Photonics and Photonic Materials, Condensed Matter Physics CDT, led the research, while Joel Collins, PhD Researcher, conducted the experiment. The research is published in the journal ACS Nano. Twisted Meta-molecules as They Really Are following questions to improve their forecast accuracy. It would be worth asking these ques- tions of yourself/your supplier: • How consistent is your demand? 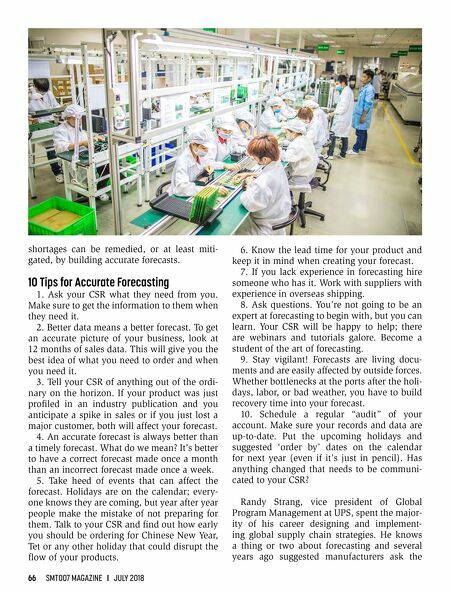 • What are the factors that influence the variable, or variables being forecast? • What level of supply chain visibility do you have? • How reliable are your modes of transport? • Do you have access to multiple modes of transport? If you're not using forecasting tools/soft- ware, there are plenty out there and all come with salespeople eager to tell you about them. We aren't going to make suggestions of specific brands or types of software to use other than to say, don't overbuy for your needs. Proba- bly the best way to start looking for forecast- ing software is to ask people you know in your industry what they use, what they would recommend and what they like or don't like about it. Finally, we suggest that it is wise to remem- ber that surprises are fun when you're six years old but not when you're engaged in over- seas manufacturing or when you're waiting on a long-delayed electronic component. "The only guarantee in forecasting is that every- thing will not go exactly as planned," Strang wrote. In our experience that's true. The best thing a customer can do is to plan for every contingency, whether it seems likely or not. If you've got a good supplier, they'll have your back. SMT007 Patty Rasmussen is a content creator at East West Manufacturing.